Use this menu item to open the dialog box for customizing the program options. This menu entry opens the registration dialog to enter the license key respectively to unlock the full version of the program. Clicking on this menu item opens the online help in the default browser. To use the online help, an active Internet connection is required. Using this menu item, the dialog window to display the program version of the license state will be opened. This dialog window contains also links to contact the technical support, the product's web page etc. In case of technical problems, you can create a bug report by using this menu item. The created file is named "Automatic Email Processor - error report" and located on the Desktop. You can then send us the error report attached to an email with a short description of the problem. This menu item allows the error log files to be emptied manually. However, the program automatically removes entries that are older than 7 days during every saving process. This menu item allows you to store the entire application data (profiles, log, etc.) as ZIP archive in a directory to be selected. After saving the ZIP archive is highlighted in the Explorer. This menu entry enables you to restore previously saved application data. Use this menu item to exit the program. A click on this button opens a window for creating a new profile. This button opens the window for editing the settings of the currently selected profile in the list. Creates a copy of the selected profile. To create a larger number of profiles, you should also consider the CSV import of profiles. Clicking this button opens a new window in which the period for an email receipt date can be defined. After confirmation, all emails received during this period (in the monitored folders) are subsequently processed using the currently selected profile. The limitation of the period is optional. With this button, you can set the selected profiles to the status Active, i. e. the profiles are applied to newly received emails. This button sets the selected profiles to the status Inactive, i. e. the profiles are ignored when processing newly received emails. By clicking the button, you can delete the selected profiles after a confirmation prompt. This menu entry opens a new window in which the period for an email receipt date can be defined. After confirmation, all emails received during this period (in the monitored folders) are subsequently processed using all active profiles. The limitation of the period is optional. With this button, you can set all profiles to the status Active, i. e. the profiles are applied to newly received emails. This button sets all profiles to the status Inactive, i. e. the profiles are ignored when processing newly received emails. Clicking this button deletes all profiles after a confirmation prompt. Note: Please ensure that the file to be imported is not opened in Excel and therefore locked. Multiple email folders to be monitored within a profile to be created must be separated by a semicolon.The profile can be exported as template into a CSV file via the context menu of the profile list. Newly created profiles are given the status Active. All profiles with this status will be applied to incoming emails. To disable a profile, click the check box at the beginning of each row. The status then changes to Inactive. The name of the profile. Displays the task types defined in the profile. "Save Attachments" and "Save Message" get the diskette icon, "Print Attachments" and "Print Message" get the printer icon. Shows the date and time of the last successful regular respectively automatic application of the profile. Shows the date and time of the last successful application of a profile using the Catch-Up function. A list of all email folders the profile will be applied to. An optional comment to the profile. Here you can give the profile a meaningful name. Optionally, you can enter a comment that will be displayed in the profile list. Here you have the option to determine a color in which the profile will be highlighted in the log list. Here you can add one or more email folders. The profile is applied to all added email folders, if the specified filter criteria are met. When the option "Including sub-folders" is activated, additionally, all emails from folders which are subordinate to the added folders are processed. Here you specify the (optional) conditions that must be met by the email properties. Only if all filter criteria are met, the email is processed. You can use logical comparison operators to set several conditions for an email property. In this case, the "AND" operator takes precedence over the "OR" operator. The filter is case insensitive - no distinction is made between uppercase and lowercase letters of the entered terms. Wildcards as the asterisk are not supported. Enter an optional name or partial name of the sender of the email to be processed. Enter an optional email address or a partial address of the sender. Enter an optional name or partial name of the recipient of the email to be processed. Enter an optional email address or a partial address of the recipient. Enter here optional the subject or a part of a subject. Enter here optional, for example, an email address or a part of an email address. This filter option is, inter alia, helpful when using alias email addresses. Normally, you should prefer the filter for the sender or recipient address. Optionally enter the message text or a part of the message text. Enter here an optional file name or part of a file name of an email attachment. If the option "Storage location - Save all attachments into the same folder" is enabled, the filters Filename Contains/Does Not Contain are only used to define an attachment to be used for dynamic naming, i. e. to use certain parts of the name of the attachment defined by the filter for the folder or file name. In the program options, you can specify whether the value displayed in Outlook or the actual file size should be used to determine the file size. Here you can define whether the task is assigned the status „Activated“ and will therefore be executed when there are matching emails, or whether it is assigned the status „Deactivated“. Activated tasks are given a check mark in the task name. Select the base directory where the attachments should to be stored by clicking on the button with the label "...". Use the Link Menu above the input field to select email properties that should be used to create an optional subfolder structure within the base directory. Use the Link Menu above the input field to select email properties from which the file name should be generated. If you leave this field empty, the original name of the email attachment is used. Enter here an optional file name of the attachment to be processed. This can be useful if you want to compose a new file name from parts of the original attachment file name. To change the preview file name, click on "Preview". Enter here optional the expected (or a similar) subject of the emails to be processed. This can be useful if you want to use parts of the subject for the folder or file name. To change the Preview Subject, click on "Preview". This option is required if the storage location is to be dynamically generated from the name or a part of the name of a specific attachment (for example, if an order number should be part of the name of a sub-folder) and all additional attachments should be stored into the same folder. In this case, enter into the field with the label "File name contains" the name or a part of the name of the attachment to be used as reference and enable the option. If this option is enabled, the filters Filename Contains/Does Not Contain are only used to define an attachment to be used for dynamic naming, i. e. to use certain parts of the name of the attachment defined by the filter for the folder or file name. If a file with the distinguished name already exists, the collision rule determined here will be applied. Decide whether the program should: overwrite the file, add a number or the processing date to the name, or cancel the operation. If this option is enabled, all files in a ZIP archive are extracted. If necessary, a password for the ZIP archive can be stored. By using the optional filter for the name of the files to be extracted, these can be restricted. You can also specify whether the ZIP archive should additionally be stored in the storage folder. The option "Insert ZIP archive name as prefix into the name of the extracted files" allows the unique naming of the files to be extracted if their names are always the same and instead the names of the ZIP archives vary. For automatic further processing, the path of the extracted attachment can be passed to a program as parameter. Here you can specify the appropriate settings. Here, you can optionally enter the path of a program that should be executed after the successful extraction of an attachment. Optionally enter one or more parameters that should be passed to the program to be executed by using the link menu. In the program options on the tab Other, you can specify that instead of displaying the selection menu, one of the three options above is always executed. The extracted file is part of a ZIP archive and the option "Also save the ZIP archive in the storage folder" has not been activated. After selecting the file format "PDF file", an additional button "Options..." is available. This opens a new dialog window in which the page orientation (portrait or landscape format) and the paper format (A3, A4, Letter, ...) can be defined. You can also specify whether the message, embedded messages or other attachments are to be embedded into the PDF file. Select the base directory where the message should to be stored by clicking on the button with the label "...". Use the Link Menu above the input field to select email properties from which the file name should be generated. Enter here an optional preview file name for the message to be processed. This can be useful if you want to compose a new file name from parts of the original attachment file name. To change the preview file name, click on "Preview". For automatic further processing, the path of the stored message can be passed to a program as parameter. Here you can specify the appropriate settings. Here, you can optionally enter the path of a program that should be executed after storing the message. Here you determine whether the message, attachments, or both should be printed immediately after receipt. Activate the respective check box, and then make the appropriate settings on the printer selection dialog. 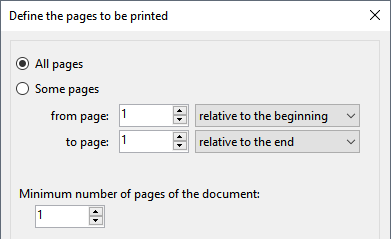 By using the "Page range" dialog, you can specify which pages to print. For example, to skip the first page, select the type "Some pages", enter the value 2 in the field "from page", and select "relative to beginning". In the field "To page", enter the value 1 and select "Relative to end". With the "Minimum number of pages of the document", you can ensure that only documents corresponding to this setting are printed. For plain text attachments, you can customize the font. Here you can set whether the email should be marked as read after successful processing. If the access type "Use add-in" is selected in the program options (section "Outlook"), it can also be distinguished whether a requested read receipt will be sent. Otherwise, the Outlook options to send a read receipt apply. Here you can select an email folder into which the email should be moved after a successful processing. Use the link menu above the input field "Subfolders" to optionally add the properties of the email that are to be included in the names of the subfolders. Up to three email forwardings can be set up here. For each forwarding, you can specify which of the original attachments to include. If the sender of a message is to be informed of a status, this can be configured here. You can send a message if other filter criteria match, but no attachments are included, or to inform the sender about a successful processing. Here you can make settings that are used to tell the processing status of an email. and enter one or more (comma-separated) recipients of the status message. Here you can optionally select a wave file that you want to play after successful processing. By using the log filter, log entries can be limited. The filter criteria may be, for example, the date of receipt, which is to be limited to a period within the last week. The comparison operator is context-sensitive, that is, he always fits the selected filter criteria. By clicking on the button with the plus or minus symbol, further filters can be added (linked with a logical AND) or the respective filter will be removed. and allows filtering and custom sorting of processing data. 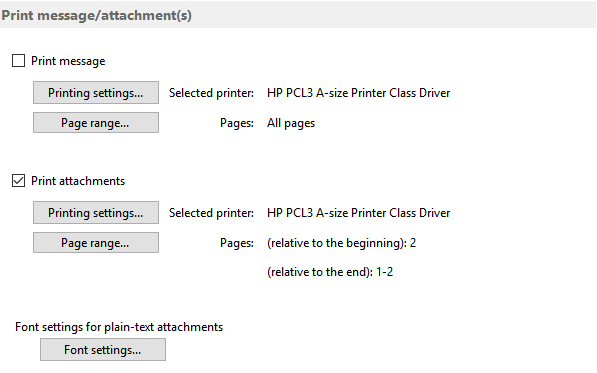 In the program options, you can configure a periodic sending of the current report. The log list contains information about all processed emails and is divided into the three tabs: "Successful processed", "Error", "No match". Shows the total number of profiles and the number of active profiles. Shows the number of entries that do not fulfill the conditions of the log filter, for example, entries that are too old. Shows the number of successful processings on the current day as well as for the period specified in the log filter (or the entire period). Shows the number of errors that occurred on the current day and for the period specified in the log filter or the total period. 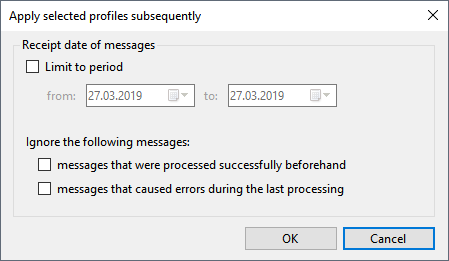 Shows for the current day and for the period specified in the log filter (or entire period) the number of messages that did not fulfill the filter criteria of the active profiles but were nevertheless received in one of the monitored email folders. Some parameters can be passed to the executable file "AEPProcessor.exe". Please read the relevant part in the PDF version of the help. Here you can define settings such as the language of the program interface and the startup behavior as well as a centrally managed profile file. As soon as a centrally managed profile file has been specified, no further changes can be made to the individual profiles - even deletion and recreation are blocked. Changes can or should only be made by the administrator. The administrator edits the profile file locally (i.e., using the application data directory "%AppData%\Automatic Email Processor") and then copies it to the designated network folder (provided that he does not use a centrally managed profile file himself). The centrally managed profile file is reloaded by the individual processes before each run and the profile list in the main window is updated at regular intervals (every 5 minutes). Updating the profile list in the main window can be forced by minimizing the application to the notification area of the taskbar and then restoring it. If the option “Independently call the "Send/Receive all" function to receive new emails” is activated, the program automatically calls the Outlook function "Send/Receive all" at the interval set below, if Outlook is not opened. Determines at what interval (in seconds) "Automatic Email Processor" checks whether new messages have been received. During the quick check, the emails of the last 30 days are checked for messages that have not yet been processed. During the Full Check, all emails in the respective folder are checked. For a larger number of emails, the full scan may take some time and processor power, so the default interval is 15 minutes. Determines whether errors are recorded. If problems occur, this option must be activated because the error informations are necessary to generate an error report. Otherwise, this option can be disabled to reduce write accesses to the hard disk. If this option is activated, processing is interrupted until the acknowledgement of the message is confirmed. This option should only be activated if the program hangs in the processing of a particular email. Some emails may differ from the standard or contain corrupted information. When the option is activated, the time available to process an email is limited. However, this increases the likelihood that your Outlook installation cannot be automated by the program. Here you can set whether the program should pause for a certain time after processing a message. This option is relevant for the further processing of saved files. The default value of 1500 milliseconds can be reduced on some systems to allow faster processing. However, this increases the probability of errors occurring. This option allows messages to be processed automatically only at the times specified here. Here you can specify whether the value displayed in Outlook or the actual file size should be used to determine the file size. Since the calculation of the actual file size is considerably more expensive, it is recommended to use the value displayed in Outlook. Here, the email account for sending notifications is set. You can use the default Outlook email account or provide custom settings. The account data specified here will be used to send status notifications to the recipients listed in the respective profile settings. This option allows you to define an interval at which an automatically generated Excel report is sent to the specified email address about the processings of a specific time period. This option serves to simplify the automated further processing of the attachments, since only letters, numbers, underscores and a dot to separate the file extension remain in the file name. The option allows to remove subject prefixes such as "FW: ", "Re: " etc. from a subject to be used for the folder name. Separate multiple prefixes with a semicolon. Here you have the option to specify instead one of the actions listed above, which should be executed without further asking.